Some people don't like anything faux. In the case of fur, the less real, the better. Not only is the imitation fabric easier to work with, it's less expensive and cruelty-free. Most DIY faux fur projects involving clothing and accessories are strictly reserved for cooler weather. But there are also a ton of cool ways to incorporate faux fur into your space all year long. We've collected some of the most popular faux fur DIYs, including some crafty ideas for this holiday season. The first DIY project is perhaps one of the most replicated. Adding faux fur to any type of chair is a smart move, whether that be an office chair, accent chair or even some dining room chairs. The project can be simple, like wrapping a faux fur blanket around a chair. Or the project can be complex by sewing together chair covers using a pattern. Despite there being an overabundance of Ikea hacks on the internet, this DIY project variation is worth checking out. The elegant and streamless addition of some white faux fur adds an element of luxury to an otherwise basic Ikea chair. However much you might loathe fur jackets, a faux fur collar can really upgrade a basic trench coat. The great thing about this project is the versatility. Creating a pattern for a faux fur collar is one thing, but being savvy enough so that the collar can also be used as a scarf—that's ingenuity. Ottomans are best when they are soft and, in this case, fuzzy. This transitional piece makes a comfortable seat but would also work just fine as an end table: simply add a tray on top to place cups or accessories. As an added style tip, notice how all the surrounding furniture is brightly colored. If you want to incorporate a white faux fur accent piece into your home, make sure all your other furnishings aren't also white. Also, don't feel like you have to have multiple pieces of faux fur furniture in a room. One well-made piece is plenty to get the look. This DIY is reserved for those who like to wear faux fur in imaginative ways. Fur boot covers used to be common decades ago when shoes were thin and lacked a lot of substance. Nowadays, a good boot can keep your legs warm, but adding this leg warmer makes them look that much more stylish. Throw pillows are one of the fastest ways to completely change up the look of a room. 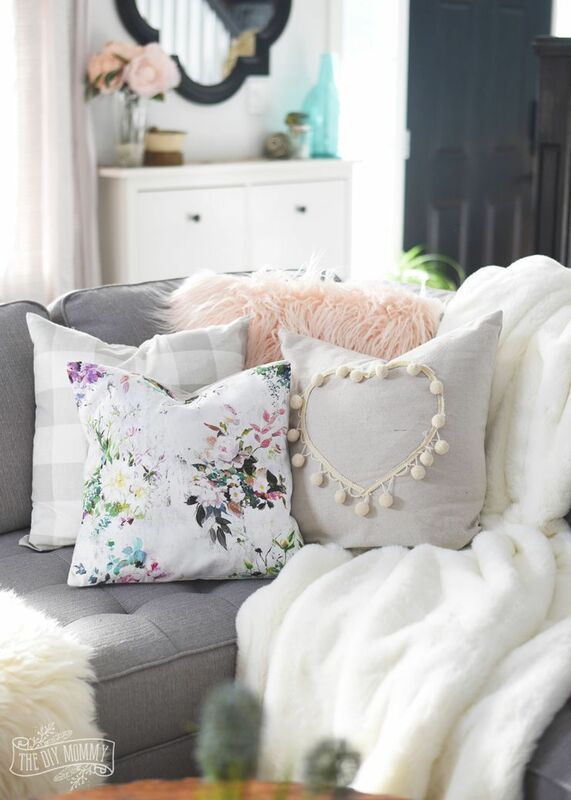 Likewise, a smart way to incorporate faux fur into your everyday decor is through some strategically placed throw pillows. Mix in one or two with other pillows that have more feminine fabrics. Learning how to make some faux fur pom poms is a great skill to acquire if you love crafting in general. Here, a larger pom pom is added to the top of a hat for added interest. Faux fur pom poms can also be used to embellish scarves, blankets and gloves. Need an inexpensive gift idea for someone who loves faux fur? Make them a pom pom keychain or hair tie. This is one of the easier DIY projects on this list to attempt. Find a piece of faux fur fabric that you like and cut it to size. When creating a swag, you want it to be the right size. Anything too big will overwhelm the chair and anything too small will look out of place. Shawls are made in a similar way as a throw or swag but without the uneven and asymmetrical shape. The larger the shawl, the cozier it will be to wear. Also, if you make the shawl large enough, it can be incorporated into your home decor when it's not in use. Toss it on a chair, ottoman or drape it on your couch. As you saw in a previous project, most faux fur decor projects use white fur that is mixed in with other brightly-colored, modern furnishings. This little footstool is an easy way to incorporate the rich feel of fur into your living room without it overpowering the space. Want to challenge yourself to think outside the box? This project will bring out your creative juices and help you add a bit of bohemian flair to your living space. Make sure you really go out of your comfort zone with this one and get artistic with it. Otherwise, this might end up looking like a childhood craft project. There's something about pink girl bedrooms and faux fur that look so darling together. Adding a fluffy area rug (that you can create yourself) is the perfect project to make a child's room feel more princess-like. If you need any more motivation on this one, imagine how much the little girls in this room will enjoy having tea parties on the rug. Or as babies, imagine them enjoying some comforting tummy time. The next few projects are dedicated to the holiday season. Some of them you may even get away with leaving out all winter long. This wreath is deceivingly simple and can be customized using varying widths and colors of ribbon. Basically, you take some old unused ornaments or anything else that is round and wrap some faux fur around them. The upcycled balls are then glued onto the wreath. The more variance in the size, the more refined the wreath will look. Just be sure to focus the larger baubles toward the middle and outer ring and use smaller baubles on the inner ring. Placement is going to make a huge difference here, so pay attention. Have you ever seen those large, plain letters in the craft store and wondered what the heck you could do with them? Use faux fur as one of your accent materials and wrap the letters up. Create vignettes using different holiday-inspired words. Here we see joy, but other words to try include merry, believe, hope or peace. If you're thinking of adding some faux fur to your holiday decor, consider also adding some flannel to the mix. Both materials work well together and make us feel cozy and warm, which is what the holidays are all about. This tree may look expensive, but all it takes is a plastic cone, some faux fur fabric and some glue. For faux fur stocking tutorials, you want to make sure the entire stocking isn't made from fur. Instead, choose to either make the inside or outside with fur. Mix and match varying colors and other patterned fabric like you see here.